The 2017 print edition of The Peaceful Pill Handbook is based on the February 2017 edition of the fully-online euthanasia and assisted suicide information book, The Peaceful Pill eHandbook. 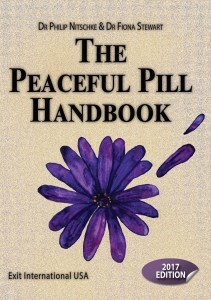 * The previous black/white edition of The Peaceful Pill Handbook (2016) is available at Amazon.com. ** There is currently no Kindle version of this book.